elcome to Knit Wit Kreations on-line! An online knitting website designed for those who love to knit whether you are an advanced knitter or just beginning. Our store location is currently in Hudson Falls, New York where we hope to see you soon. In the meantime we welcome you to please explore and browse what our website has to offer including various pictures of our store as well as our products - including new Brother knitting machines, Silver Reed, Artisan knitting machines and used knitting machines, the newest and most helpful instruction and pattern books, and all other knitting accessories, knitting yarns and essentials that may be needed for those who have already found their love for knitting. 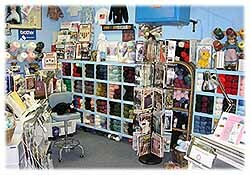 Knit Wit Kreations is your sourccccce for all of your knitting supplies. We take MasterCard, Visa, Money Orders, Checks, and Cash.